A NEW HOUSE ON THE SEA FOR THE "BEPPE CROCE COLLECTION"
Carlo Croce tells us about the yacht portraits collection created by his father Beppe and recently entrusted to Genoa's Museum of the Sea (MuMa). President, your father was fond of boats but did he love art in general? I wouldn't say so. Of course he loved beautiful things and among these refined instruction, but his passion as a collector concentrated in time exclusively in yacht portraits. My father has been the president of the International Yacht Racing Union and used to go to London twice a year to attend the IYRU meetings. It was in London, a town he was very fond of, that he often went to antiquarians where he started buying yacht portraits. Soon after, becoming acquainted with his interest in yachting, the same antiquarians looked for him to offer him that sort of paintings. My sister, in an affectionately mocking way, suggested that some old painter would paint them just to satisfy his wishes. It was almost by chance that he put together a collection that became important in time. Collecting yacht portraits became his hobby. I must say that he did not invest much money in this activity and that he enjoyed himself a lot. His hobby was the result of a great passion for the marine culture and for the British culture. Can you tell some anecdotes on his paintings? 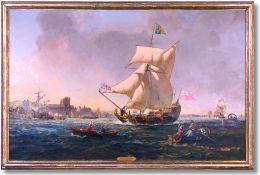 Only two paintings were given to him as a present (The training Shooner Sir Winston Churchill in Tall Race and The Yacht Mary, given by the borgomaster of Amsterdam to Charles II on his return to England in 1660- file 033-035). 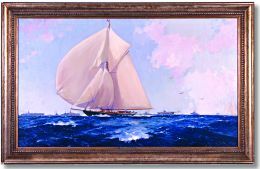 The first one is the portrait of a 30-meter J class, with 50 crewmembers and a 50-meter high mast. 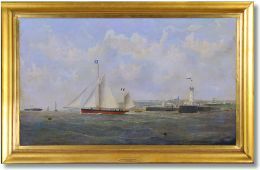 The yacht appears on the background of the Isle of Wight and to the right there is a yacht of the Savoy family flying the Italian flag. 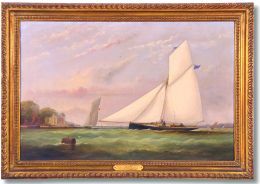 This, of course, has been a courtesy of the painter for my father, because it seems that the Italian yacht had never been to the Isle of Wight those days. 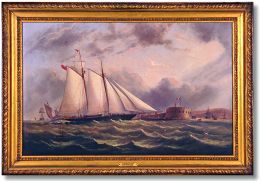 The painting number 134 portrays the schooner Waterwitch at the Isle of Wight in front of the Royal Yacht Squadron (RYS), hosted in a castle given as a present to an RYS member in ancient times. This very exclusive club was also very male chauvinist and women could not absolutely enter. A legend is told about the 100 Guineas Cup, when a veranda had to be built outside the club because not even the Queen, as a woman, could have been admitted inside. The Queen, side by side with Prince Albert, followed the event onboard the royal yacht Victoria and Albert, but for her and for many British the regatta was very stressful. In fact, America's rush around the Island of Wight had been so astonishing that everyone saw her arriving, her silhouette could be seen in the distance, alone and with a clear edge on the other 15 English yachts. When Her Majesty asked which was the second sailing yacht, someone answered with typical British humor, with a quip that made history: "There is no second!" 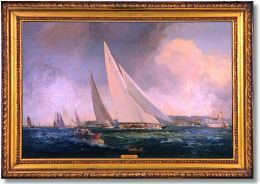 The party for the winners of the 100 Guineas Cup, a trophy offered by the RYS, later called America's Cup and given to the New York Yacht Club (NYYC), took place onboard the royal yacht. Prince Charles, today's heir to the throne, recently removed the bathrooms from the Queen's mansion on the Island of Wight where she used to go on vacation for the regattas. How come your father was so fond of the British culture? My great grandfather Beppe taught him to appreciate whatever was English, he loved going to London and accustomed and maybe even spoilt him into appreciating beautiful things. My father was absolutely tuned in to that world and loved all of its aspects, besides, the exclusive yachting environment of those times was congenial to his lifestyle. One must not forget that, back then, England was very important and the Commonwealth included 60 countries that, with their vote, governed the International Yacht Racing Union. How did Beppe Croce become President of the International Yacht Racing Union? Before him was elected Peter Scott, the son of Mr. Scott, founder of the WWF, creator of the small Panda, who died in the South Pole. When Peter decided to participate as helmsman in the America's Cup he put my father at the head of the Union, remaining in office for twenty years. How was his painting collection "mania" taken at home? My mother, who did not share with him the passion for sailing, always stood side by side with him. My brothers and I always helped him in his search for paintings, in buying them and hanging them to the walls of our home. We enjoyed it very much. I must say that seeing the whole collection on the walls of our house was fantastic. The last painting arrived when my father was dead and I keep it as a dear memory. How was the idea of giving the Collection on a free loan to Genoa's MuMa born? When my sister's son asked whether he could have some paintings for his London office and other relatives made similar requests, we understood that the collection that my father cherished risked to be scattered here and there. Because of this the family decided to entrust what became the precious Beppe Croce Collection to the Museum of the Sea. Our family is grateful to the Museum for the restoration and preservation work made on the paintings. Sometimes I like to think of them altogether, with their nice colors that brightened the walls of our house and I wish I could put them together in one large space. Of course, space is a problem, because at present the Museum dedicated three rooms to the Collection. Nevertheless, I hope, a solution to this problem will be found. We are willing to collaborate to this project, to gather my father's collection under the same roof in a house that might remind of the one where he initially wanted it. I think this would be the best way to keep my father's memory alive in town, in Genoa and all over the world. How is this collection considered abroad? Foreign connoisseurs are highly attracted and the British even more. Did you continue this collection? 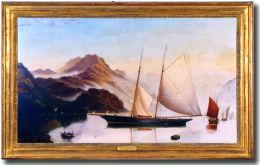 No, though there are painters such as Dews or Tim Thompson who painted yacht portraits that are estimated at approximately 80,000 Euro today. Don't you think these painters can be considered as the "Franco Pace" of paintings? Yes, indeed. The Britannia portrait for example looks like a photograph. This yacht was owned by Giorgio V, the king who died before the war, and participated in regattas for thirty years before sinking in front of the RYS. 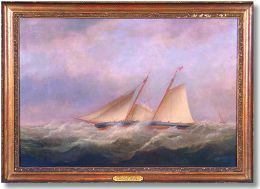 Then she was recovered and her furniture was bought by the NYYC to furnish the club guestrooms. How were the Owners back then? They were great British aristocrats who had considerable incomes and who loved sailing, but did not take part in maneuvers and in this they were very similar to present day suyperyacht owners. They idled their days away and lived in a world that today we consider much like an operetta, nevertheless, it is from that world that the fighting spirit that thrives in the sailing world today was born. In this second aspect, on the contrary, modern owners are different for they are generally very busy and employ people by the thousands. What did your father pass down to you in addition to his passion for the sea and for sailing boats? Definitely he passed down to me his distinctive kindness and education that made him deal with the King of Great Britain in the same way as with a deckhand.